Let’s face it: Life can be tough and we all need a little support sometimes, whether from a friend, a therapist, our practice, or all three. When I step onto the mat feeling like I’m on shaky terms with everything around me, I often turn to poses that help me reclaim a sense of personal power. And one pose I immediately think of is warrior III, or virabhadrasana III. Out of all of the warrior poses, I find that warrior III can feel the most chaotic and uncentering, which makes working to attain stability in it all the more empowering. As my mind, body, and breath unite in an effort to maintain my balance in this pose, I always find the strength I need to stay grounded, even if I physically fall down. I am able to remember that I am strong and resilient and capable of finding balance within. Working with elements of unsteadiness in asana so often helps me to face the unsteadiness of life head-on, and with a deeper sense of clarity. When I use props in practice I can also explore (quite literally) leaning into that sensation of support we all, at times, require. Working with elements of unsteadiness in asana so often helps me to face the unsteadiness of life head-on and with a deeper sense of clarity. Using props to make poses more challenging also helps me tap into my own strength and resilience. Below, I share three ways to help you find your own inner warrior in warrior III—they’re propped but not necessarily easier, as the awareness and concentration required in these variations can be quite challenging. To set up for traditional virabhadrasana III, begin by standing in a well-established tadasana (mountain pose) with your feet hip-bone distance apart, and your big toes parallel to each other. Keep the fronts of your thighs firm and hips level (so that one hip is not higher than the other). Lift your arms straight up overhead into urdhva hastasana (upward salute pose), externally rotating your upper arms. Then, shift your weight into your left foot and hinge forward at your hips, lifting your right leg away from the ground. Think of your body as a seesaw: As you hinge forward, your back leg lifts and your torso lowers until your entire body is parallel to the ground. Keep your arms alongside your ears, fingertips reaching forward, while you reach back through your right inner heel. Your hips should be square to the ground, your back toes active, pinky toe spinning toward the ground, and back inner thigh spinning up toward the ceiling. Fight the good fight against gravity by drawing your inner thighs toward the midline of your body and lifting up through your lower belly. Send your energy out through the entire length of your body, from fingertips to both soles of the feet. Focus your gaze on a spot about three feet in front of you for three to five steady breaths. To come out, reverse the seesawing: Simultaneously lower your right foot as you bring your torso upright into urdhva hastasana. 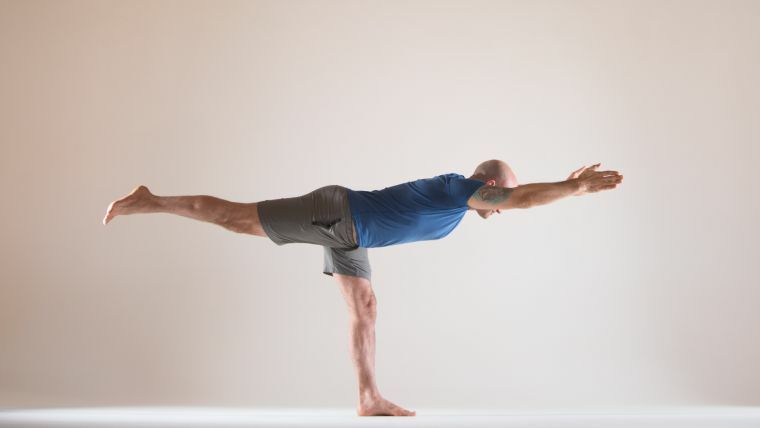 Release your arms alongside your body and then practice the pose on the other side. That’s the big-picture view of virabhadrasana III. Focusing on alignment while balancing on one leg can be a headful when initially learning the pose or even when trying to refine it. 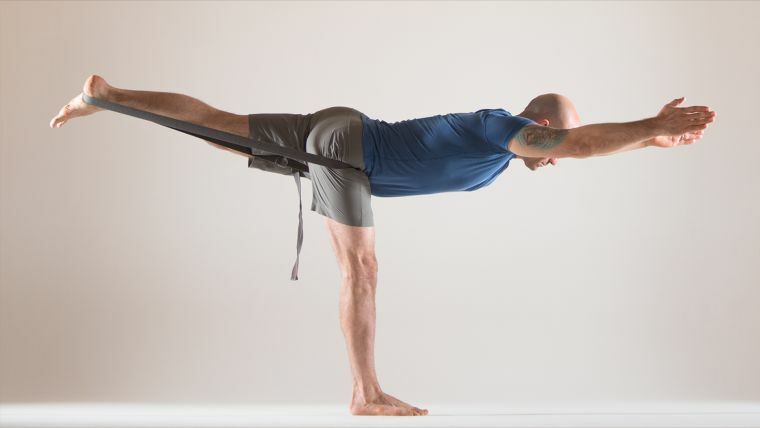 The following explorations of warrior III are intended to deepen your experience of the pose so you can feel the power of your own inner warrior. To ease the challenge of maintaining alignment while balancing on one leg and still experience strength and stability, use a chair and a wall for support. Set up a chair about two of your leg lengths away from the wall with the back of the chair facing the wall, and pad the back of the chair with a blanket to your liking. Standing midway between the chair and the wall, with your back facing the wall, place your hands on the back of the chair. Shift your weight into your right foot, and place the sole of your left foot against the wall at your hip height with your left toes pointing down toward the floor. Adjust the chair and your right leg as needed so that your right leg is perpendicular to the ground. Once you find your footing, press strongly into both feet as you fold your body forward until you can rest your upper arms on the chair back and your forehead on the blanket between your arms. Firm your arms, turning your palms to face each other. Press your left foot firmly into the wall as you reach your arms forward. You might feel a good amount of traction in your spine, and as you create more length thanks to the support of the chair and wall, you may have to move the chair slightly forward. Once you’ve found your spine’s maximum axial extension, work on the smaller, gratifying details of your alignment, like keeping weight in your right heel instead of leaning predominantly into the ball of your foot and toes, contracting your lateral right buttock, turning the left hip down, drawing the low belly in and up, and widening across your upper back. Hold for three to five breaths. To come out, soften your right knee and lower your left foot to the ground. Use your hands on the chair to lift your torso upright. Then switch sides. This version is for those of you who feel comfortable balancing on one foot and can maintain warrior III with control. Make a loop with a strap that is the length of your leg from your heel to right below your hip bone (iliac crest). If your strap is not long enough, connect two straps and then form one large loop. Stand in tadasana and hold your opened loop out in front of you, with the buckle near your hands, as if you were pushing a supermarket cart. Step both of your heels onto the strap, then step your right foot forward. Once you are prepared, come into warrior III by hinging forward at your hips until your entire body is parallel to the floor. The more you press the left heel back into the strap, the more you will feel the strap pull the front of the right thigh back. Hands can remain on the hips or you can reach them out in front of you. Hold for three to five breaths. To come out, bend your right knee slightly and lower your left foot to the ground as you simultaneously lift your torso to stand upright. You practice your balance more in this version than in the prior one, but you have the same reminder to press your foot firmly into support. The strap also reminds you to roll the lifted leg’s hip down toward the floor because otherwise the strap becomes less taut (and less effective): As the hip lifts, the distance between the legs narrows. Another benefit of using the strap is the traction from the strap pulling the standing upper thighbone back, helping to align the femur in the center of the hip joint even as it gives you a constant reminder to keep the weight in the right heel. Once you’ve mastered the first two versions of warrior III, challenge your pose by standing on a block. 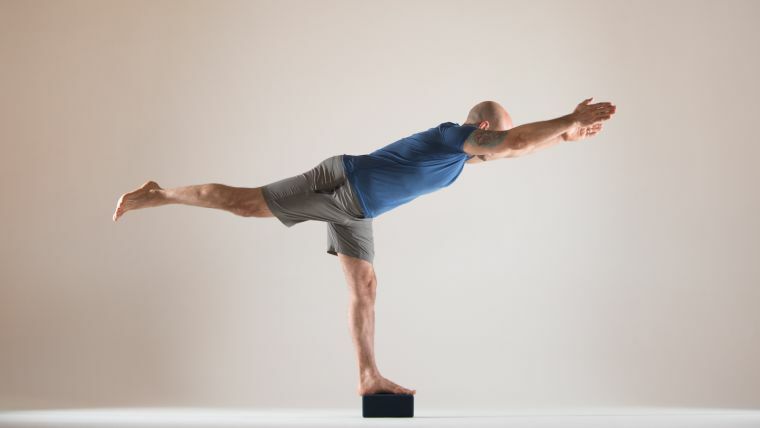 Stand on the block with your left foot, and lift your right foot up to meet the left without letting it touch the block. The right foot might be slightly higher than the left; the more you firm your outer left hip in, the higher the right foot will be. Keep your thighs firmed and your arms up alongside your ears. Then hinge forward at the hips while keeping the left hip stacked over the left ankle. For this version it is not necessary for the torso to be parallel to your mat. Hold for three to five breaths. When you are ready to come out, lower the right foot back alongside the left, and lift the torso before stepping down and changing sides. In this version, what’s more important than bringing your torso absolutely parallel to the ground is that you can feel the hamstrings of the standing leg engaging to control the action of folding. Also key is the sharpness and focus of the mind that is required. As we become accustomed to balancing on one leg, our attention can wander. Standing on the block will focus your attention until it is as sharp as a hawk’s gaze, and the body will be on high alert as well because it knows it is balancing on an elevated surface. Remember: Warriors aren’t born with a bravery gene—bravery is a skill. 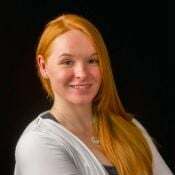 They learn to use their resources to the fullest because they realize that most of life’s battles are in the mind and that they are won with strategy, not by winging it. Hopefully, these versions of warrior III will allow you to develop your own strategy to tap into your personal power as you stand strongly on your own on and off the mat.